Amelia M. L. Montes studies Chicana and Latina literature and theory, late nineteenth century and contemporary American literatures, and Lesbian, Gay, Bi, Trans literatures. She also writes fiction, non-fiction, and poetry. Her scholarly work focuses on narrative contexts that complicate and contradict national, social, and personal identities: how our own complex relationships to power cross ethnic, gender, sexual, and racial borderlines. 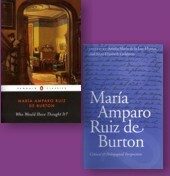 She has published several articles on the nineteenth-century Mexican American writer, María Amparo Ruiz de Burton (1832-1895), and has edited a new edition of Ruiz de Burton's first novel, Who Would Have Thought It? Montes' short stories have appeared in a number of journals and collections such as River City Journal, Saguaro, Elixir, Hers3. She is currently working on a fictional memoir entitled Nothing Sweet About Me. Read more of Amelia's writing on La Bloga. All photos appearing on this site are ©Amelia M.L. Montes.